A 204-year-old copy of the Treaty of Amritsar, dating back to the days of the British East India Company, was on Wednesday sold for more than four times its estimated price at an auction of rare historical documents. 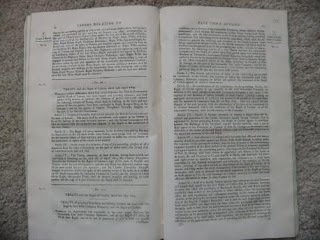 The treaty, struck between Maharaja Ranjit Singh, founder of the Sikh empire, and Charles T Metcalfe of the British East India Company in 1809, was bought by an anonymous bidder for £3,400 (around Rs. 3.2 lakh). The base price set for the historic document was £600 to £800 (Rs 54,000-74,000). "We are honoured to be selling this rare document. The Amritsar treaty was very important in the foundation of the great empire Maharaja Ranjit Singh had built," said Richard Westwood-Brookes from Mullock's auction house. The East India Company's need for a defensive treaty against the French resulted in the pact, which chalked out the frontier of land controlled by Ranjit Singh along the Sutlej river. The treaty was presented to the British Parliament in 1818 and went on to define Indo-Sikh relations for a generation. A number of other historical documents and photographs related to Punjab went under the hammer on Wednesday. These included a stamp with the image of Maharaja Ranjit Singh and an early watercolour of a Sikh Guru which fetched £440 (around Rs. 40,000). Other key items up for auction included a large collection of rare and early Sikh books in English and Punjabi, mostly out of print and some dating back to the early 19th century. Mullock's specialises in the sale of rare documents and had recently sold a collection of personal items belonging to Mahatma Gandhi, including his handwritten will, for an estimated £300,000 (about Rs. 2.9 crore).